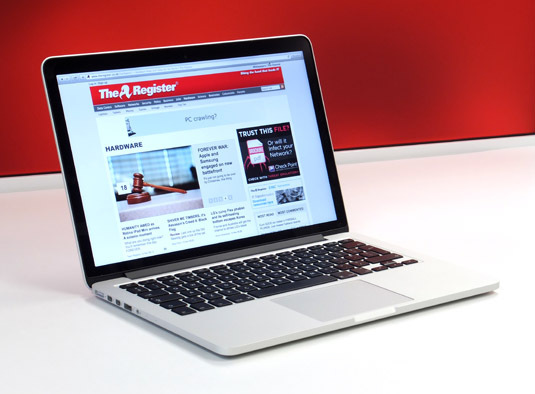 Review It’s been quite some time since I looked at a new MacBook Pro. However, I spend a lot of my time looking at an old one. I’ve a first generation Unibody model. What a great idea that was. Just unscrew the back for easy access to the RAM and the drive. The battery wasn’t easily swappable, but hey, you could whip the HDD out with a twirl of just two bracket screws. Wow, with this form factor Apple had come such a long way since its alu-body MacBook Pros that involved removing layers of circuitry just to upgrade the internal drive. Is this all you'll ever need in a MacBook Pro? The easy upgrading on the Unibody was one of the reasons I bought it. So here I am looking at Apple’s latest MacBook Pro 13in and the word "upgrade" doesn't appear anywhere in the user guide. 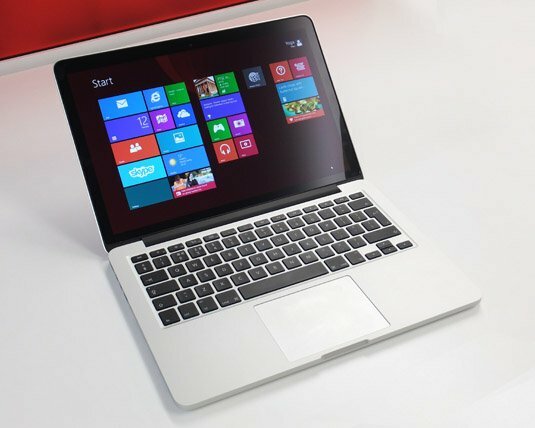 It’s the entry level Retina display model, so it features a 2.4GHz Intel Core i5-4258U CPU with Integrated IRIS graphics 5100, 4GB of 1600MHz DDR3 RAM and a 128GB SSD. As with the 15in model, the 13in gets the Haswell CPU refresh and Thunderbolt 2 and, of course, the display. Apple has managed to lose 40g but the size is near identical to its Ivy Bridge predecessor. Skip back to the more portly Unibody MBP 13in generation – the last lot came out in 2011 – and you’d have been lugging around a thicker model with extra 500g in weight and no Retina display either. You would have been able to tinker with it though. As has been mentioned many times, the MacBook Pro is no longer upgradeable. You buy the configuration you want can afford and that’s it. OK, so world + dog knows this now, but how this impacts on a laptop lifetime’s use takes a moment or two to sink in. £1100 you say? And this is to drive into a computing cul-de-sac. One of the first things we check out on a new Mac here at Vulture Central is its benchmarking prowess up against PC laptops we’ve had a gander at. To do that involves Boot Camp, Apple’s utility to enable the Mac to run Windows natively so we can fire up PCMark. A consequence of this is that we also discover just how nicely it plays with Windows. My rather diverting experience with a MacBook Air this summer revealed you needed the USB stick containing the Boot Camp drivers plugged into the left port. Like you’d know right? This time, I wasn’t going to be caught out: left port it was going to be, even though I couldn’t find a tech doc that insisted on it. Yet this MacBook Pro fell at the first fence; the simple task of partitioning the drive. It was just hanging and the Activity Monitor bore this out too with its “Boot Camp Assistant (Not Responding)” message. I gave it a little while to redeem itself, but no. Force quit. Second time lucky though and, more to the point, having already installed the various updates including one for the EFI firmware, the installation was a breeze with the latest Boot Camp 5 (Build 5358) drivers in tow. Apparently some Haswell MacBook Pro early adopters hadn’t had the best of times with Windows 8 and updating to 8.1, but it would seem the latest batch of updates smooths out the creases. Boot Camp not responding: can you see the Windows influence here? That said, Boot Camp did kick in rather suddenly once the partitioning was established, in the blink of an eye displaying a grey screen… of death? I wondered. Moments later it began to reboot from the Windows 8 CD. Just remember to reformat the Boot Camp partition and away you go. That first part took about 25 minutes with the Windows 8.1 download and instal adding another 30mins. So you should be done in an hour.